Vadodara, formerly known as Baroda, was once the capital of the Gaekwad state of Gujarat. It emerged with the expansion of Maratha power in the 18th century. In the old city there is the Kirti Mandir, the mausoleum of Vadodara's rulers and adjoining the Sursagar Tank there is the Nyaya Mandir, the High Court, built in a mixed Mughal and Gothic style. 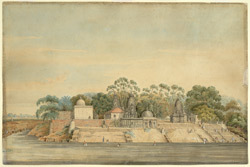 This drawing depicts the group of temples with curvilinear spires situated north of the city near the Cantonment and Residency.